John Green sounds seriously overcaffeinated in this video post, but he does touch upon what editing books is actually about. Though I liked Pride and Prejudice and Zombies, I haven't made a mad dash to read other classic/paranormal or horror mash-ups. It seemed like an idea that worked marvelously once, but would quickly become a leap-on-the-bandwagon sort of thing with other books. However, I do like the idea of mashing up Cinderella and Sleeping Beauty with ninjas and vampires. I think what's attracting me is the hope that these characters will become women who do something instead of women who have things done to them. I'm not as crazy about the "special twist" giving readers "the opportunity to make key decisions" for the main characters. But if I come upon one of the books, I'll give it a chance. I spent Saturday evening at my only nephew's wedding. The ceremony and reception were held at a day camp dear to the couple and their friends because they'd worked there, or, in my nephew's case, attended camp there as a child and then worked there as a counselor right through college. It was a beautiful and unique event, but very labor intensive for the bride and groom in terms of decorating and getting the place ready for guests. In fact, the bride started making decorations last winter. So what did this young woman do to relax yesterday, her first day of married life? She went to a used book sale at a library. Subterranean Press is a speciality publisher of horror, suspense, and "dark mystery genres." 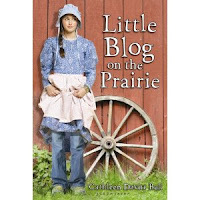 Its website has a Subterranean On-line feature, which this month is doing a Special YA Issue. I read Younger Women by Karen Joy Fowler of Jane Austen Book Club fame. It was a very good story, but I definitely wouldn't call it YA. It has an adult protagonist with definite adult issues. In fact, one of the really intriguing aspects of the work is that it seems like a very mainstream "women's" story with a paranormal element that I don't want to tell you about because it was a bit of a kick when I read it, and I don't want to ruin it for anyone else. The main character raises some great points about the paranormal genre she finds herself in. I found the Subterranean Press site by way of Jennifer Represents, which I'll be following for a while because I attended Jennifer Laughran's presentation at last Saturday's conference. Back when I first started publishing in the last century, you didn't see a lot of lengthy acknowledgments at the back of books. It seems to me that it's something that's started turning up in the last decade. And I've often noticed that the length of the thank yous has a connection to the quality of the book--the longer they are, the worse the work. I just finished a novel I'd looked forward to reading because I'd enjoyed an earlier book by the same author. I liked the historical setting, it was plenty moody, but the plot was seriously clunky with some events seeming very tacked on. The threads were not well integrated. We're not talking seamless here. The acknowledgments went on for two and a half pages. I was left feeling kind of glum because I don't have two and a half pages of people involved with my professional life to thank. I'm also wondering if there might be some kind of jinx at work here. If I did manage to scrape together a lengthy list of folks to thank, would that doom my book? Would they end up wishing they just hadn't been mentioned? Is This Also About Plot? Or Am I Just Obsessed With That Element Of Fiction? "'The basis of drama is ... is the struggle of the hero towards a specific goal at the end of which he realizes that what kept him from it was, in the lesser drama, civilization and, in the great drama, the discovery of something that he did not set out to discover but which can be seen retrospectively as inevitable.'" David Mamet in Lunch with David Mamet. Perhaps you've heard that plotting scheme that involves giving a character something to want and then keeping it from her? I've heard it a lot, (and talked about it here frequently, too) and I've decided I don't like it. I don't think it's a method for creating a plot. I think it's more of a formula for a plot. And then there's the question of what character? And what do you give her to want? Where the hell is all that supposed to come from? I like the idea of characters having goals, because I think it's more dynamic and provides some narrative drive right off the bat. And the quote above from David Mamet struck me, maybe because he used the word "goal." Though I question whether something always has to keep characters from achieving goals. Why can't the move from objective to objective toward the goal be a workable and dramatic plot? I've got to stop ranting for a while and do some Reader Responses. So here goes. It seems as if I've been reading a lot of YA lately. My own local library purchases a lot of series books for younger readers, which don't attract me particularly, though I will have a post on a couple sometime in the future. So I've had to branch out a little in my book foraging. 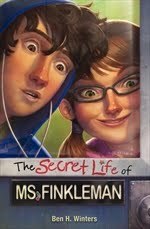 I found The Secret Life of Ms. Finkleman by Ben H. Winters at another library I've started hitting occasionally. What caught my eye is that it's a contemporary, school-based book. No paranormal elements. Not a serial. No obvious signs of a sequel. Really, it's a unique offering in today's children's literature climate. The Secret Life of Ms. Finkleman involves some kids discovering a fascinating secret about their very dull music teacher, Ms. Finkleman, and what that knowledge, once it gets around, leads to. The book uses a third-person narrator without a point of view character--the point of view shifts among characters. 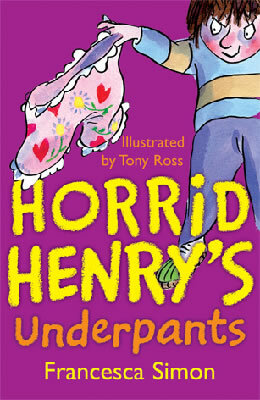 This is most unusual in children's literature today. The first-person dominates, and when the third person is used, only one charcter's inner workings is usually featured. That character is on stage all the time. 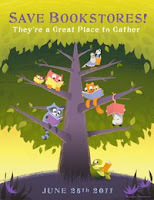 The author manages his shifting point of view just fine, and it will be a bit of an eye opener for a lot of child readers. With The Secret Life of Ms. Finkleman, however, punk rock is far more organic to the story/plot. It also isn't used to simply define a character. As in, oh, that's the outsider kid who listens to rock. There is one of those, but he's significant to the story, a story that has to do with punk. He's more than just a few characteristics. I do think the adult characters are a little over the top. They're cartoonish, while the child characters are far more rounded and realistic. The assistant principal, for instance, is a whipping boy for the dragon lady principal, and one dad makes a rare appearance to encourage his daughter to blackmail a teacher. I think, myself, that this is an illustration of how going for humor can sometimes undermine a story element. Nonetheless, The Secret Life of Ms. Finkleman is a good read, and a definite relief from the relentless parade of fantasy and girl group stories. 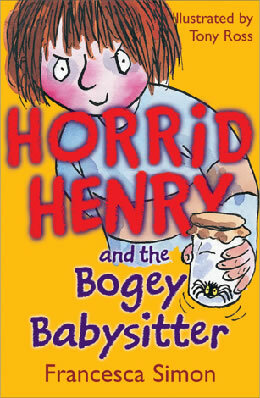 For kids who particularly like realistic fiction, it will be a joy. Though I didn't mention it, Ms. Finkleman has some mystery going on, enough so it was nominated for an Edgar Award. So was Griff Carver by the way. I am saying nothing about the whole Wall Street Journal Darkness Too Visible brouhaha because anything I would say would be something I've said before, just as that entire article is something that anyone who has been involved in children's and YA literature has heard before. Someone does a "Damn, those YA books are full of grim adult crap, huh?" article every couple of years. In fact, six years ago, someone wrote an entire book on the subject. It's as if a generation only lasts a couple of years these days and YA is all new to the writers of these articles who are stunned...stunned, I tell you!...by what they find on the YA bookshelf. And then the people who read the articles are apparently the equivalent of a whole new generation, too, because their response to the Bad, Bad YA article is to be...stunned! Absolutely stunned! Come on. Could we get a collective memory, which, I'm sure you'll remember, I was just talking about a couple of days ago, so we don't have to do this same thing over and over again? Because you know I have very little tolerance for repetition. I have to go work on a new chapter. And get something to eat. How come I had to find out about Libba Bray's new book Beauty Queens by way of a hand-me-down copy of Entertainment Weekly I got from my sister? If I hadn't needed something to read on the treadmill, I would never have looked at it. What's more, my workout routine, such as it is, is shot to hell, so I could very well have missed finding out about Beauty Queens, and it sounds funny. I know I've cut back on my blog reading, but still, didn't Bray win the Printz Award just last year? I know awards don't mean a lot to me, but I thought they did to other people. Doesn't she deserve a little buzz for her next effort after that? Or do we have no collective memory? That may be the case. I've wondered about that. Today is the start of this year's 48 Hour Book Challenge. Have a great time all you reader/bloggers who will be taking part. Victory through Carrots at The Children's War. I will be far more suspicious of...well, just about everything...as a result of reading that.